Connecting people who care with projects that matter. 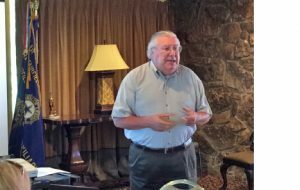 Mike Doyle, Executive Director of the newly formed Fairfield Bay Community Foundation, addressed the FFB Rotary on September 9. Members of the Rotary, an organization with a rich tradition of service to the Bay, learned how the Community Foundation becomes another vital avenue to preserve and enrich all that we enjoy here. The mission is simple. The Community Foundation is dedicated to connecting people who care about Fairfield Bay with projects that matter, to enrich the quality of life in Fairfield Bay now and for future generations. The Foundation is a non-profit, charitable organization that works with those who live, work and vacation in Fairfield Bay; acting on behalf of those who love this amazing community and alongside those who want to ensure we leave a legacy of continued prosperity for generations to come. This begins by joining together to identify community-wide opportunities, address community-wide challenges, and to undertake projects that will produce meaningful, lasting, improvement in the economic and cultural life of our town. Please contact Mike Doyle, Executive director at [email protected] or 479-871-7281 for more information, to learn how you may play a role, or how you can help fund the Foundation. All contributions are tax deductible.